Next leafleting opportunity: Nestlé's satellite symposium at the International Congress of Paediatrics in Melbourne, Australia, 27 August. Venue: Melbourne Convention and Exhibition Centre. Time: 17:00 for 17:30 event start. Click here for Nestlé announcement. 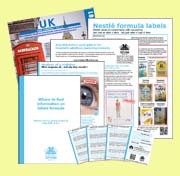 Baby Milk Action can provide colourful, concise information leaflets for anyone interested in leafleting to raise awareness of Nestlé's baby food marketing malpractice. Contact us to receive some or use the links below to download pdf files to print your own. Leafleting on public property is allowed in the UK. However, if you are assembling a number of people to make a demonstration then it is wise to inform the police of what you are doing. The police will only be concerned that you remain orderly and do not cause an obstruction. Leafleting on private property is at the discretion of the property owner. Shopping centres and car parks may be private property. It is good manners to approach a member of staff and ask them what the company policy is and where the boundary of the private land is. If the policy is not to allow leafleting you will be asked to leave the property in any case. If you are told you cannot leaflet then take up positions by the entrances and exits to the land on the public side of the boundary. Be sure that you do not prevent the free flow of people and do not obstruct drivers from seeing the road. Be polite when leafleting. Do not force leaflets on members of the public, invite people to take a leaflet and do not get upset if they refuse. Make sure you understand the background to the boycott in case you are asked further questions. See the Nestlé-Free Zone page for the latest information. Baby Milk Action's address and phone number is on our materials so you could suggest people contact us if you cannot answer their questions. If you have further questions about leafleting or demonstrations please e-mail Baby Milk Action and ask. And if you do go leafleting, please let us know how it goes. Why boycott Nestlé Fairtrade KitKat?